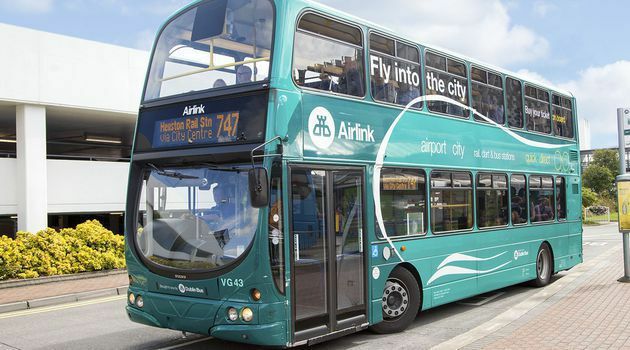 Enjoy a quick, easy, and money saving option with this Airlink express shuttle bus transfer between Dublin Airport and Dublin City, stopping-off at various locations within the city centre. · Connect with national bus at Busáras, Luas Red & Green lines, Pearse, Connolly and Heuston Rail Stations. Route 747 to City Centre stops include; The 3Arena, IFSC, Talbot Street (Busáras and Connolly Station), Gardiner Street, O’Connell Street, College Green and Temple Bar, Christ Church, Usher’s Quay, and Heuston Station. Route 747 to Dublin Airport stops include; Wolfe Tone Quay, Arran Quay Christ Church, College Green & Temple Bar, O’Connell Street, Busáras & Connolly Rail Station, IFSC, The 3 Arena. Route 757 stops to City Centre include; Dublin Convention Centre, Custom House Quay & IFSC, Eden Quay, O’Connell Bridge, Temple Bar, Westland Row, Merrion Square, St. Stephen’s Green, Earlsfort Terrace & National Concert Hall and Camden (Charlotte Way). Route 757 to Dublin Airport stops include; Camden (Charlotte Way), Earlsfort Terrace & National Concert Hall, St. Stephen’s Green, Merrion Square, Westland Row, Busáras & Connolly Rail Station, IFSC, The 3 Arena. Route 747: From Dublin Airport: First bus Monday – Saturday at 06:00. Last bus Monday – Sunday at 00:30. First bus Sunday at 07:00. Route 757: From Camden (Charlotte Way): First bus Monday – Saturday at 04:55. First bus Sunday at 06:40. Last bus Monday – Sunday at 23:25. Route 757: From Dublin Airport: First bus Monday – Saturday at 05:00. First bus Sunday at 7:25. Last bus Monday – Saturday at 00:25. Last bus Sunday at 00.15. Duration: Journey time to Camden (Charlotte Way) is 60mins approx.